If you’re not a fan of spiders, you’re far from alone. But before you swat away another spider web, remember this: Relative to weight, the strength of a spider web rivals steel and Kevlar, the material used to make bullet-proof vests. (That’s important when your dinner flies headlong into your trap and writhes violently as it tries desperately to escape.) This tensile strength has inspired humans to develop a surprising number of products—but it’s just one of the fascinating facts that may give even arachnophobes a new appreciation for these eight-legged architects. 1. SPIDER SILK TRANSFORMS FROM LIQUID PROTEIN TO SOLID THREAD WHEN IT LEAVES THE BODY. Spiders are like tiny silk production factories. Inside their bodies, thread is stored as a highly concentrated liquid. A common garden spider can produce as many as seven types of silk, each made up of a different sequence of proteins. Each type of thread serves a distinct purpose: one, for example, makes the web stretchy to better absorb the impact of insects smacking into it; another makes the thread less brittle. Still other proteins protect the threads from bacteria and fungi, and keep it moist. 2. NOT ALL PARTS OF THE WEB ARE STICKY. In fact, the silk itself isn't sticky. Picture a classic web, like one made by an orb weaver spider: The basic structure includes radial threads that extend out like wheel spokes from the center. Another set of threads spiral out in concentric circles. The silk used to construct these two parts of the web is actually produced by different glands, which is why one is sticky and the other isn’t. The silk’s gumminess comes from a super strong polymer adhesive produced by another gland in the spider’s abdomen. The spider secretes droplets of this adhesive along the spiral threads of the web to catch its prey. Most spiders leave the center of the web free of this “glue” so that they can move around with ease. But when the spider needs to travel along the sticky threads of its web, it has a special tool: tiny claws on its legs help it keep from getting stuck. 3. LIGHT, TEMPERATURE, AND HUMIDITY CAN AFFECT THE STRENGTH OF THE WEB. The adhesive droplets that spiders apply to their silk become sticky only when the silk leaves the spider’s body. But its strength can be affected by environmental factors, including humidity and temperature. Recently, scientists discovered that ultraviolet radiation also affects the glue. In a series of experiments, researchers found that spiders inhabiting bright, sunny places, such as common garden spiders, produce webs better able to withstand UV radiation than those of nocturnal spiders and forest dwellers, where webs are generally less exposed to direct sunlight. 4. SPIDERS USE THEIR SILK FOR MUCH MORE THAN CATCHING DINNER. 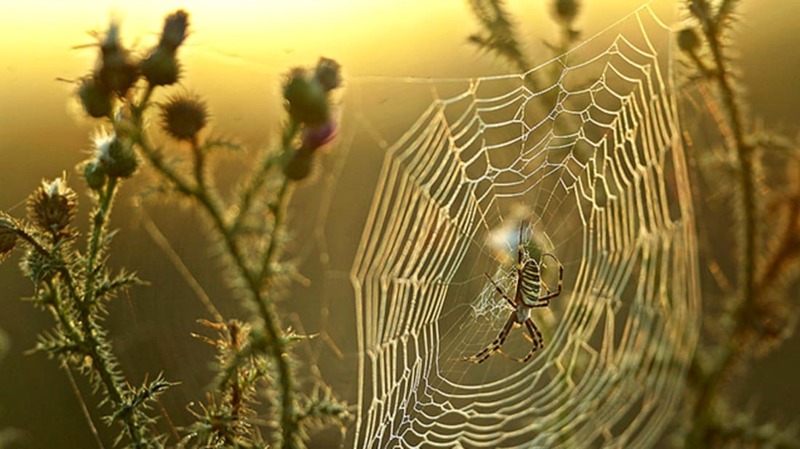 Webs are used for trapping prey, but spiders produce silk for other reasons, too. Hunting spiders often make silk to use as drag lines to trail behind them as safety nets while they walk and stalk. Other spiders use a specialized silk to create egg sacs, or even to build a little protective shelter for themselves. Perhaps most remarkably, some spiders use their silk to pick up air currents and go sailing up into the sky, sometimes migrating hundreds of miles. When conducted en masse, these so-called mass ballooning events can involve millions of tiny spiders. When they land—or if they have an unsuccessful takeoff due to unfavorable winds—their silken strands can blanket the ground in thick white layers, as they did in Memphis near the end of 2015. 5. AT LEAST ONE KIND OF SPIDER USES ELECTRICITY TO SNARE ITS PREY. Sometimes called the garden center spider for its love of humid greenhouse conditions, the feather-legged lace weaver has a truly far-out way of catching a meal. Researchers at Oxford University discovered that, rather than spinning sticky webs like orb weavers, this spider produces an incredible nano-thin silk inside a special organ called the cribellum. It uses special hairs on its hind legs to comb the silk as it emerges from the body, creating an electrostatic charge in the process. Together, the charged threads form “poofs,” similar to a ball of wool, that trap prey. 6. SOME SPIDERS' WEBS ARE LARGE ENOUGH TO CROSS ENTIRE RIVERS. The female Darwin’s bark spiders build enormous webs—some extending more than 80 feet—across rivers and lakes. By building their super-strong web across the water like a bridge, they can catch large insects like dragonflies that quickly swoop and rise along the water’s surface. The female will spend days building and reinforcing the so-called bridge lines that she casts across rivers to anchor the web on each bank, and repairing damage to the center caused by large insects. Meanwhile, the male of the species, which is considerably smaller than the female, hangs out in plants close to the webs to watch the show from the sidelines. Scientists are racing to learn more about this newly described species as deforestation in Madagascar diminishes their habitat. 7. ANOTHER AMAZING ARACHNID CAN SURVIVE COMPLETELY UNDERWATER. In Europe and Asia, the diving bell spider has carved out an extraordinary niche. It spends its entire life underwater—the only spider known to do so. It can survive underwater because of its bell-shaped web, which it anchors to aquatic plants, with additional lines of silk extending up toward the surface. The spider climbs these lines of silk and lifts its rear out of the water to collect air bubbles around the tiny hairs that line its legs and abdomen. Carefully holding the air bubbles between its back legs, it descends back to its bell-shaped web and places the bubbles inside to form one large bubble. Scientists recently discovered that the bell can also take up dissolved oxygen from the water, behaving as a kind of gill. If the spider isn’t very active, this combined oxygen supply can last it an entire day. 8. WE LOOK TO SPIDER WEBS FOR ALL KINDS OF USEFUL PRODUCT IDEAS. Because spider silk is so flexible, light, strong, and water resistant, it has a ton of potential applications. Researchers are busy developing bioinspired, synthetic versions of spider silk like this “liquid wire,” as well as adhesives based on their sticky glue-like protein droplets. Taking inspiration from spider silk, researchers have recently made big strides in designing medical devices, parts, and supplies that need to be strong and stretchy or sticky. These include artificial tendons, ligaments, and implants, as well as sutures, adhesives, and bandages. Spider silk protein is also aiding in the design of textiles and protective products that need to be strong and flexible but also light, like body armor, airbags and even athletic helmets. But while scientists may draw ideas from spiders, actually using spider silk or protein has one major drawback: harvesting enough to facilitate commercial scale production of these items. So researchers have turned to transgenics—inserting the genes for spider silk inside other organisms. Like E. coli bacteria, which reproduce quickly. And goats. Yes, goats. By implanting spider DNA in goats, scientists can harvest components of spider silk from their milk. The hope is to eventually be able to extract those proteins on a scale large enough to support mass production. So the next time you recoil in disgust at a spider, remember: You’re dissing a tiny master of engineering.